I bought this book from Crosswords, Mumbai and thoroughly enjoyed. For me buying this book is more than essential. 2. The Logic Game 25 Tom Swift Jr books. 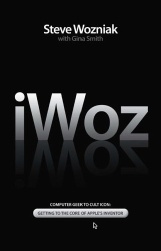 Woz's Dad as inspiration. 3. Learning by Accident 43 Pranks at schoo, scaring and fooling others. 4. The "Ethical" TV Jammer 56 Funy TV Jammer Pranks. 5. Cream Soda Days 75 Thoughts on US policy for Vietnam. and building Cream Soda Computer. Jobs and Woz liked Bob Dylan more than Beatles. 6. Phreaking for Real 93 Making Blue Box, Meeting Captin Crunch. 7. Escapades with Steve 112 Selling Blue Boxes to people for Free Phone calls along with Steve. 8. HP and Moonlighting as a Crazy Polack 119 Working as an employee at HP and Dial-a-Joke funny experiences. Meeting with Alice (First Wife). 9. Wild Projects 137 Steve Jobs working at Atari a gaming company and Woz at HP. Woz researching to send characters to TV. Woz and Jobs making Hardware based gaming machine in 4 full days without sleeping. 10. My Big Idea 150 Making Computer with many processors(Not Microprocessor), attaching TV for output and Typewriter for input. 11. The Apple I 167 Making Microprocessor based computer to excite people at Homebrew Computers Club. 173 Starting Apple Computers Pvt Company. Selling more than 150 Computers. 13. The Apple II 186 Adding Color to Apple II. Mike Markkula investing $250,000. Zaltair hoax prank by Woz at Faire. 17. Have I Mentioned I Have the Voice of an Angel? 244 This is all about Woz spending lavishly on WoodStock like event to promote Progressive Country music. Woz ended up loosing 12 million $ twice, but made great contacts and started philanthropic activites. 18. Leaving Apple, Moving to Cloud Nine 259 Left Apple and started his Own company CL9 (Cloud Nine) to manufacture universal remote controls. Joe Ennis and Laura Roebuck were with Steve Wozniak in CL9. 19. The Mad Hatter 277 Steve Wozniak as Father to his child (Jesse) his separation from second wife. If you're from Bay-Area, California, US. If Your are from place where technology is not important. If you liked this book, I would highly recommend you to see the movie "Pirates of Silicon Valley" a documentary by HBO. That will touch your satisfaction further to sky.